Five-time world land speed record holder Craig Breedlove was born March 23, 1937. He was the first to reach 400 mph (640 km/h), 500 mph (800 km/h), and 600 mph (970 km/h), using several turbojet-powered vehicles, all named Spirit of America.In 1962, he made his first attempt, in a freewheeling tricycle (ignoring FIA rules requiring four wheels, at least two driven; in the event, FIM happily accepted it powered by a General Electric J47 engine. On 5 August 1963, this first Spirit made her first record attempt, using just 90% of available thrust to reach 388.47 mph (625.18 km/h) over the measured mile. The return pass, on 95% power, turned up a two-way average of 407.45 mph (655.73 km/h). Spirit of America was so light on the ground, she did not even need to change tires afterward.For 1964, Breedlove faced competition from Art Arfons’ Wingfoot Express (piloted by Tom Green) as well as from brother Art Arfons in his four-wheel FIA-legal Green Monster. With more engine power, Breedlove upped the record to 468.72 mph (754.33 km/h) then to 526.28 mph (846.97 km/h). making him the first man to exceed 500 mph (800 km/h). This pass was not without incident, however, for one of his drogue parachute’s shroud lines parted, and Spirit of America ran on for 5 mi (8.0 km) before near-missing a telegraph pole and coming to rest in a lake. This record stood all of twelve days before Green Monster broke it, recording a two-run average of 536.71 mph (863.75 km/h). Craig Breedlove isn’t the only record breaker born on 23rd March. 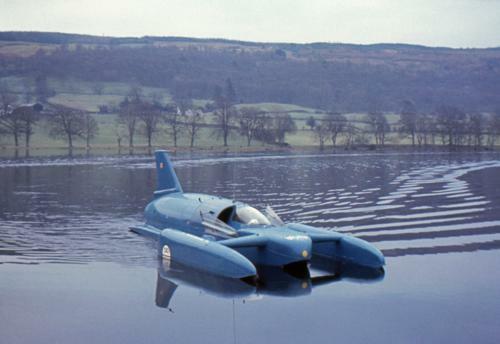 British World Land and Water speed breaker Donald Malcolm Campbell, CBE was also born 23 March 1921 He broke eight absolute world speed records in the 1950s and 1960s. He remains the only person to set both world land and water speed records in the same year (1964). Campbell began his speed record attempts using his father’s old boat Bluebird K4, but after a structural failure at 170 mph (270 km/h) on Coniston Water, Lancashire in 1951, and the death of John Cobb, who was killed in 1952 trying to break the water speed record, he decided that he would develop a new boat.Designed by Ken and Lew Norris, the Bluebird K7 was an all-metal jet-propelled 3-point hydroplane with a Metropolitan-Vickers Beryl jet engine producing 3,500 lbf (16 kN) of thrust. It was unveiled in late 1954, and taken, in January 1955, to UllswaterWestmorland in the English Lake District for its initial trials. After many, problems and a number of modifications to K7, Campbell finally succeeded on Ullswater on 23 July 1955, where he set a record of 202.15 mph (325.33 km/h), beating the previous record by some 24 mph (39 km/h) held by Stanley Sayres.The name “K7” was derived from its Lloyd’s unlimited rating registration. It was carried in a prominent circular badge on its sponsons, underneath an infinity symbol.Campbell set a total of seven world water speed records in K7 between 1955 and 1964. The series of speed increases—216 mph (348 km/h) later in 1955, 225 mph (362 km/h) in 1956, 239 mph (385 km/h) in 1957, 248 mph (399 km/h) in 1958, 260 mph (420 km/h) in 1959—peaked on 31 December 1964 at Dumbleyung Lake, Western Australia when he reached 276.33 mph (444.71 km/h); he remains the world’s most prolific breaker of water speed records. Campbell was awarded the CBE in January 1957 for his water speed record breaking, and in particular his record at Lake Mead in the USA which earned him and Britain very positive acclaim. In 1956, Campbell began planning a car to break the land speed record, which then stood at 394 mph (634 km/h). The Norris brothers designed Bluebird-Proteus CN7 with 500 mph (800 km/h) in mind. The CN7 was completed by the spring of 1960, and was powered by a Bristol-Siddeley Proteus free-turbine engine of 4,450 shp (3,320 kW). Following low-speed tests conducted at the Goodwood circuit in Sussex, England, the CN7 was taken to the Bonneville Salt Flats in Utah, USA, scene of his father’s last LSR triumph in 1935. The attempt was unsuccessful and CN7 was written off following a high-speed crash in September at Bonneville. Campbell was seriously hurt, suffering a fracture to his lower skull, and was by 1961 on the road to recovery and planning the rebuild of CN7. The rebuilt car was completed, with minor modifications, in 1962 and, by the end of the year, was shipped to Australia for a new attempt at Lake Eyre in 1963. The Lake Eyre location was chosen as it offered 450 square miles (1,170 km2) of dried salt lake, where rain had not fallen in the previous 20 years, and the surface of the 20-mile (32 km) track was as hard as concrete. As Campbell arrived in late March, with a view to a May attempt, the first light rain fell. Campbell and Bluebird were running by early May but once again more rain fell, and low-speed test runs could not progress into the higher speed ranges. By late May, the rain became torrential, and the lake was flooded. Campbell had to move the CN7 off the lake in the middle of the night to save the car from being submerged by the rising flood waters. The 1963 attempt was over.Campbell and his team returned to Lake Eyre in 1964, but the surface never returned to the promise it had held in 1962 and Campbell had to battle with CN7 to reach record speeds (over 400 mph (640 km/h)). After more light rain in June, the lake finally began to dry enough for an attempt to be made. On 17 July 1964, Campbell set a record of 403.10 mph (648.73 km/h) for a four-wheeled vehicle (Class A). Campbell was disappointed with the record as the vehicle had been designed for much higher speeds. CN7 covered the final third of the measured mile at an average of 429 mph (690 km/h), peaking as it left the measured distance at over 440 mph (710 km/h). In 1969, after Campbell’s fatal accident, his widow, Tonia Bern-Campbell negotiated a deal with Lynn Garrison, President of Craig Breedlove and Associates, that would see Craig Breedlove run Bluebird on Bonneville’s Salt Flats. This concept was cancelled when the parallel Spirit of America supersonic car project failed to find support.Campbell now reverted to Bluebird K7 for a further attempt on the water speed record. After more delays, he finally achieved his seventh WSR at Lake Dumbleyung near Perth, Western Australia, on the last day of 1964, at a speed of 276.33 mph (444.71 km/h).He had become the first, and so far only, person to set both land and water speed records in the same year. Campbell’s land record was short-lived, because rule changes meant that Craig Breedlove’s Spirit of America, a pure jet car, would begin setting records later in 1964 and 1965. Campbell’s 429 mph (690 km/h) speed on his final Lake Eyre run remained the highest speed achieved by a wheel-driven car until 2001; Bluebird CN7 is now on display at the National Motor Museum in Hampshire, England, her potential only partly realised. Donald Campbell decided a massive jump in speed was called for following his successful 1964 LSR attempt in Bluebird CN7. His vision was of a supersonic rocket car with a potential maximum speed of 840 mph (1,350 km/h). Norris Brothers were requested to undertake a design study Bluebird Mach 1.1 (CMN-8) was a design for a rocket-powered supersonic land speed record car. Bluebird Mach 1.1 was to be rocket-powered. Ken Norris had calculated using rocket motors would result in a vehicle with very low frontal area, greater density, and lighter weight than if he went down the jet engine route. Bluebird Mach 1.1 would also be a relatively compact and simple design. Norris specified two off-the-shelf Bristol Siddeley BS.605 rocket engines. The 605 had been developed as a take-off assist rocket engine for military aircraft and was fuelled with kerosene, using hydrogen peroxide as the oxidizer. Each engine was rated at 8,000 lbf (36 kN) thrust. In Bluebird Mach 1.1 application. In order to increase publicity for his rocket car venture, in the spring of 1966, Campbell decided to try once more for a water speed record. This time the target was 300 mph (480 km/h). Bluebird K7 was fitted with a lighter and more powerful Bristol Orpheus engine, taken from a Folland Gnat jet aircraft, which developed 4,500 pounds-force (20,000 N) of thrust. The modified boat was taken back to Coniston in the first week of November 1966. The trials did not go well. The weather was appalling, and K7 suffered an engine failure when her air intakes collapsed and debris was drawn into the engine. By the middle of December, some high-speed runs were made, in excess of 250 mph (400 km/h) but still well below Campbell’s existing record. Instead of refuelling and waiting for the wash of this run to subside, Campbell decided to make the return run immediately. This was not an unprecedented diversion from normal practice, as Campbell had used the advantage presented i.e. no encroachment of water disturbances on the measured kilometre by the quick turn-a-round, in many previous runs. The second run was even faster once severe tramping subsided on the run-up from Peel Island (caused by the water-brake disturbance). Once smooth water was reached some 700 metres or so from the start of the kilometre, K7 demonstrated cycles of ‘ground’ effect hovering before accelerating hard at 0.63g to a peak speed of 328 mph (530 km/h) some 200 metres or so from the southern marker buoy. Bluebird was now experiencing bouncing episodes of the starboard sponson with increasing ferocity. At the peak speed, the most intense and long-lasting bounce precipitated a severe decelerating episode (328 mph – 296 mph, -1.86g) as K7 dropped back onto the water. Engine flame-out then occurred and, shorn of thrust nose-down momentum, K7 experienced a gliding episode in strong ground effect with increasing angle-of-attack (AoA), before completely leaving the water at her static stability pitch-up limit of 5.2°. Bluebird then executed an almost complete somersault (~ 320° and slightly off-axis) before plunging into the water (port sponson marginally in advance of the starboard), approximately 230 metres from the end of the measured kilometre. The boat then cartwheeled across the water before coming to rest. The impact broke K7 forward of the air intakes (where Donald was sitting) and the main hull sank shortly afterwards. Campbell had been killed instantly. Mr Whoppit, Campbell’s teddy bear mascot, was found among the floating debris and the pilot’s helmet was recovered. Royal Navy divers made efforts to find and recover the body but, although the wreck of K7 was found, they called off the search, after two weeks, without locating his body. World Meteorological Day takes place annually on 23rd March and is organised by The World Meteorological Organization (WMO). Te WMO is an intergovernmental organization with a membership of 191 Member States and Territories. It originated from the International Meteorological Organization (IMO), which was founded in 1873. Established in 1950, WMO became the specialised agency of the United Nations for meteorology (weather and climate), operational hydrology and related geophysical sciences. It has its headquarters in Geneva, Switzerland, and is a member of the United Nations Development Group. The current Secretary-General is Michel Jarraud. and the current president is David Grimes. The World Meteorological Organization (WMO) is a specialized agency of the United Nations. It is the UN system’s authoritative voice on the state and behavior of the Earth’s atmosphere, its interaction with the oceans, the climate it produces and the resulting distribution of water resources. WMO has a membership of 191 member states and territories (since 4 December 2009). The Convention of the World Meteorological Organization was signed 11 October 1947 and established upon ratification in 1950. WMO became the specialized agency of the United Nations in 1951 for meteorology (weather and climate), operational hydrology and related geophysical sciences. It originated from the International Meteorological Organization (IMO), which was founded in 1873.